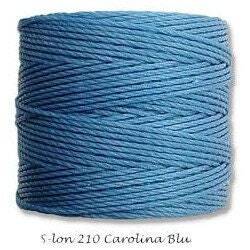 C-lon 210 is a medium weight cord best for size 6 and 8 seed beads as well as for macrame or bead crochet. C-Lon bead cord is .5 mm 3-ply twisted, bonded multifilament nylon cord. Use for 6, 8, & 11/0 seed beads or other beads with at least a .8 mm hole. Use for kumihimo, macrame & stringing.